To order any item, click here. The "See here for details" links will (or should) open in a separate window; close it when you've finished with it. If anything on this page doesn't work, contact the Webmaster. The Austrian Post Offices in the Levant. Tchilinghirian and Stephen Revisited. See here for details. The book costs � plus P&P. 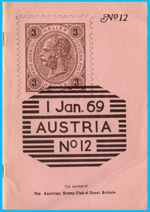 A Celebration of Austrian Philately is a "Festschrift" published to mark our 60th anniversary. It is a 160+ sides full-colour A4 perfect-bound book, and will appeal to specialist collectors in many areas. The articles are in English; each has a brief summary in German. See here for details. The price is now only � plus P&P at cost; it weighs about 775 grams in an airmail paddybag. CD: Vienna's Pneumatic Post System (the Rohrpost) operated between 1st March 1875 and 1956. This CD is a substantial update of the on-paper first edition, now superseded and also out-of-print. It includes descriptions of the system, numerous examples, copies of all available maps, illustrations of the apparatus, lists of the offices, copies of the decrees and regulations - indeed everything that resulted from ten years of research! The authors, Andy Taylor and Colin Tobitt, have been assisted by contributions from colleagues in Austria, Germany, Canada and USA. The 'book' is in full colour, with almost 1000 illustrations, and is presented as a web site on a CD. It is ISBN 978-0-900118-10-14. The table of contents is here. The CD costs � (or 15 Euro) including postage to anywhere in the world. 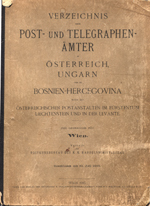 CD: Index of Austro-Hungarian Post and Telegraph Offices in 1910. On CD. See here for details. The CD costs � (or 15 Euro) including postage to anywhere in the world. 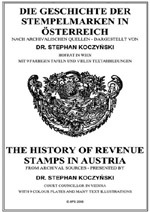 CD: Dr Stephan Koczynski抯 definitive history of Austrian Revenue Stamps [Die Geschichte der Stempelmarken in Oesterreich] has long been out of print and is almost impossible to obtain. 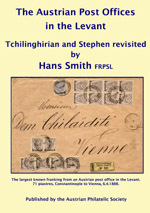 Now, the Austrian Philatelic Society has enhanced the original and published it on CD in fully-text-searchable form. See here for details. The CD costs � (or 15 Euro) including postage to anywhere in the world. 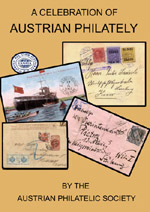 Back numbers of the APS's Journal "Austria" are available to non-members at �per copy plus P&P. Some older issues may be facsimiles or second-hand originals. [It may be better value to join the Society, since the price-to-members is �] Contact the Editor for details.